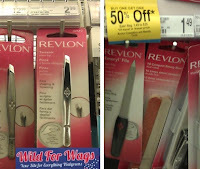 Revlon Tweezers only $0.24 + $0.11 Emory Boards at Walgreens! Hopefully you got some coupons last weekend. If you did, you can score super cheap Revlon beauty tools at Walgreen's! = $0.24 each wyb 2! = $0.11 each wyb 2!